Wading warm water creeks and streams is one of the less popular but nevertheless fun elements of the sport of fly fishing. Some people never even get that far. 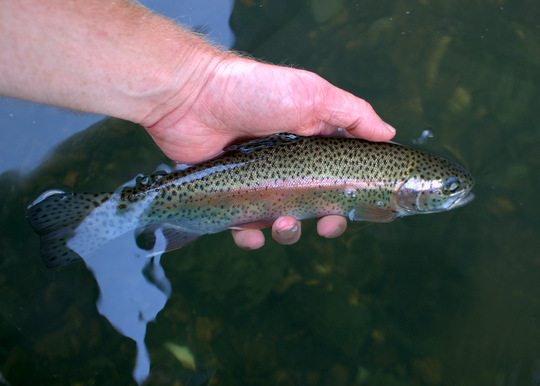 If you only fish a few days a year, you are likely still focusing on trout for each of your trips. That is just fine, and with a few exceptions, what attracted most of us to the sport to begin with. In fact, I still fish for trout the majority of the time. That said, when I have a few hours to kill and want to have fun, you can probably find me with a four weight rod and some topwater bugs looking to have fun with the smallies and panfish. 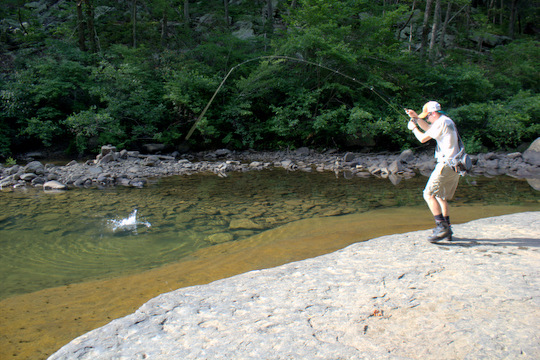 Last Tuesday, I checked with my buddy Chase to see if he wanted to fish some creeks. We agreed on when and where to meet and not much later I was headed out. 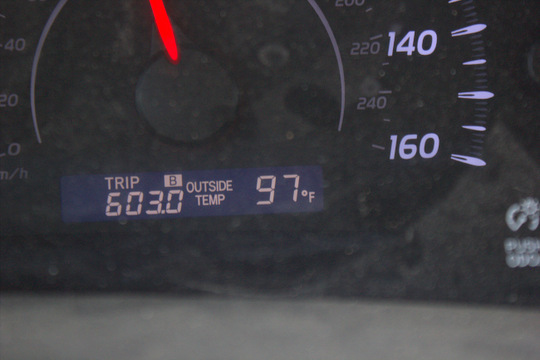 Looking down at the outside thermometer on my car, I knew it was going to be a hot one. When we arrived stream-side, we found the usual collection of people out swimming, drinking beer, jumping off of the rocks, and generally scaring all of the fish. That always means a hike so we hit the trail. By the time we had hustled back about a mile, my shirt was soaked with sweat, and I was almost ready to jump in and swim instead of fish. As soon as we started fishing it was obvious that the discomfort was just a small price to pay. The fish were hungry and looking up, always a good combination for fun. I nailed a gorgeous sunfish on one of my first casts. The fish hit so hard that I thought it was a smallmouth. Chase soon followed up my sunfish with a nice smallie that would turn out to be the best fish caught for the trip. We saw some much larger fish that, while mildly interested, were much too intelligent for us on this trip. With a little foresight and planning, these fish are just as catchable but a few factors need to come together to make that happen. In the end, with the heat and humidity, we didn't make it as far up the creek as I sometimes do. The trip was eventually cut short when I didn't want to make a required scramble around some boulders through thick brush. If the weather was cooler and we had more hours of daylight, then we probably would have continued up the canyon. At this furthest point upstream, I paused to take some pictures. 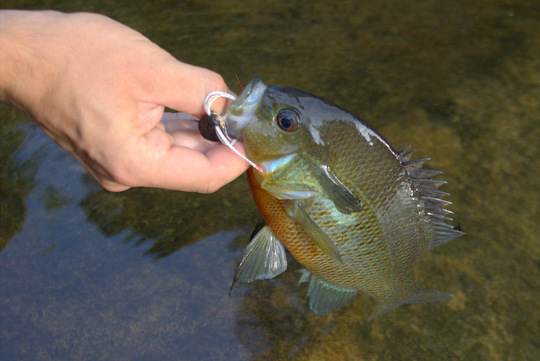 After shooting several of the scene, Chase nailed another good fish, this one a nice sunfish. A couple of pictures later and we headed back downstream. The thought of a Gatorade in the cooler in my trunk kept us moving back down the trail at a good pace. I'll be back to this stream soon, but probably not while it is so hot. This next week is going to be great for fishing across the area. We got enough rain this weekend to help just a little with the water levels and the water temperatures are dropping like a rock. The good fishing should last at least through the upcoming holiday weekend. 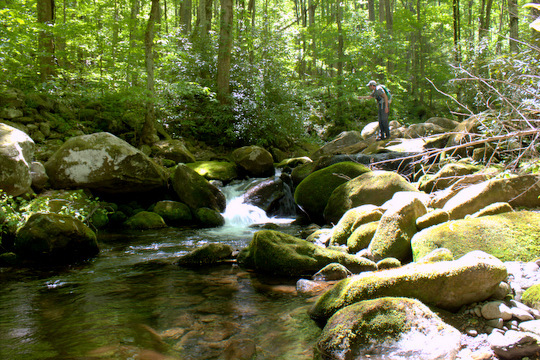 If you have been thinking about a midsummer trip to the Smokies or to walk a smallmouth creek, this is the time to do it. The topwater bite is ON for smallies on the creeks and floats are putting out good fish and numbers still. The flows are very good right now for Caney Fork floats. Contact me if you are interested in a guided trip for trout in the Smokies or on the Caney Fork, or smallmouth bass and panfish on the Cumberland Plateau streams. Email me at TroutZoneAnglers@gmail.com or call/text me at (931) 261-1884. Moving is always hard. In fact, I dread the day I have to move again just because of the work involved. Packing, loading, unloading, unpacking and don't forget all of the cleaning involved on both ends of the trip. New gear is kind of like moving, especially in the case of moving from one storage system to another. It can take some getting used to, but usually there is also some excited anticipation involved. The transition will be easy in many ways since I'm moving from one waist pack to another. On the other hand, I know I'll reach for something only to discover it isn't where I expect it to be. Probably I'll do that several times over the next few days and weeks. One of the major selling points for me on this new system is how easy it will be (I hope!) to eliminate the lanyard from my current setup. I'm not convinced that I won't pull it back out, but I'm excited to at least attempt fishing without the lanyard. Less clutter dangling off of my neck for one thing, and just a cleaner system in general all points to this new system staying for a while. As with all moving, I've been comparing the new pack with the old. Some things I like while on others the jury is still out. For example, I loved the twin water bottle holders on each side of the old waist pack. The new pack has a single water bottle holder on the bottom of the pack. By the way, my old pack is a William and Joseph pack (back from the days when their packs were still made with zippers versus the newer magnetic closure system). The new pack, as the title above says, is a Simms Headwaters Guide Hip Pack. I've noticed that William and Joseph is still making a pack with twin water bottle holders so there is no guarantee that I'll stay with my current setup. I also really like the roominess of the old pack. 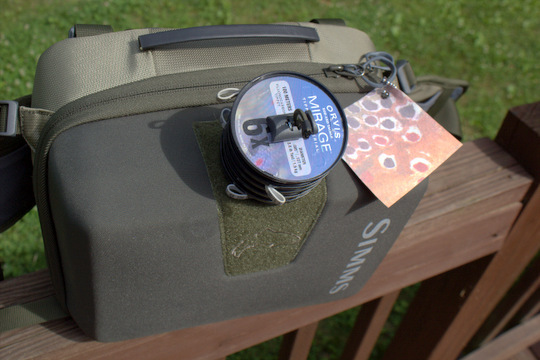 I like the roominess on the Simms Guide pack as well, just in different ways. For example, on the old pack, there is one massive main compartment without any dividers other than one mesh pocket along the back wall. On the new pack, there is a handy divider with plenty of pockets to stash things like leaders and extra tippet spools, split shot containers, strike indicators, and all of those little gadgets that most fly fishers eventually find themselves carrying. Simms definitely put a lot of thought into this pack. The downside of the divider is that it is non-removable. In other words, once you get stuff crammed in all those little storage pockets, it can be tough to add a LOT of fly boxes. Right now I comfortably have four in there. My old pack was set up in such a way that I could probably get 6-8 fly boxes in easily and still have plenty of room for the other stuff. I'm sure with some repacking I can get more in the new pack, but it would be great if the divider came out easily when I wanted it to. Velcro would have been an easy addition/solution there. One of the things I really like on the new pack is how easy it is to store tippet and forceps in a readily accessible position. 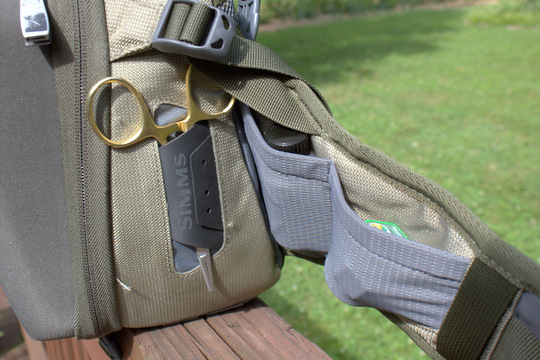 The tippet holder attaches to the pack through the use of velcro. This is probably the main thing that makes me wonder if I'll go back to a lanyard as I have yet to see how well the velcro holds up. In my experience, velcro generally has some limits to its longevity. Again, time will only tell. 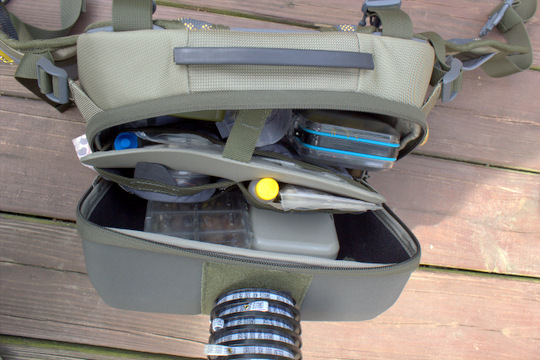 The new pack is also great because it does only have one main compartment. Yeah, I know, I just sort of complained about that feature. The good side of it is that I open one zipper and everything is at my fingertips. Flies, split shot, indicators, tippet, floatant, and many other things are all right there ready to use. That prevents me from wasting time and opening multiple pockets to re-rig someone who has just broke off or got a birds nest so bad that the best solution is to cut it out. As a guide, I deal with that on a regular basis, as a fisherman too I might add. So at the end of my move, my initial thoughts are largely positive. I'm already excited to try out the new pack. My clients may wonder why I keep reaching for imaginary gear, but in the end I think we'll still get out there, find a few fish, and trick some into eating our flies. Once I get some time on the water in I'll follow up. 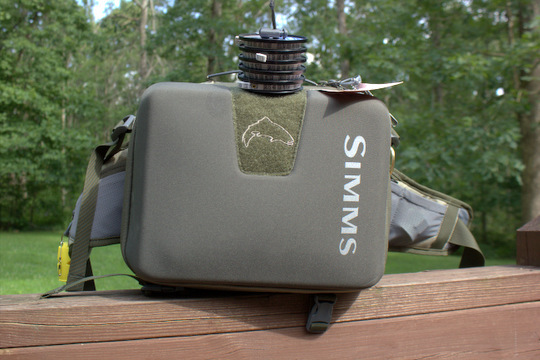 Until then, I am recommending the Simms Headwaters Guide Hip Pack as a great way to carry your gear out on the water. Where have I been fishing? 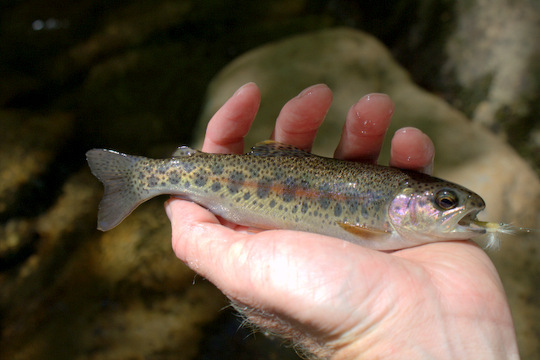 Not the lower elevation streams that are already excessively low for this time of year and running much too warm for fishing to be ethically acceptable. That much I can say. 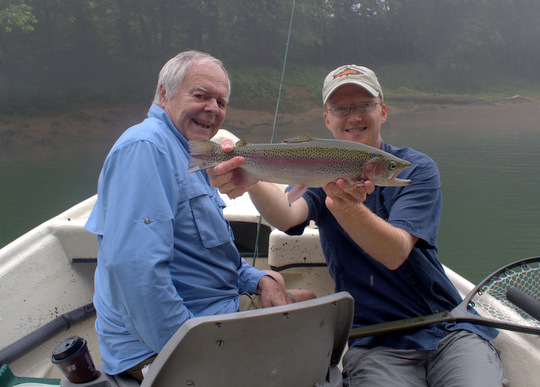 Of course, some trips have been on the Caney Fork River which fishes very well during dry years. 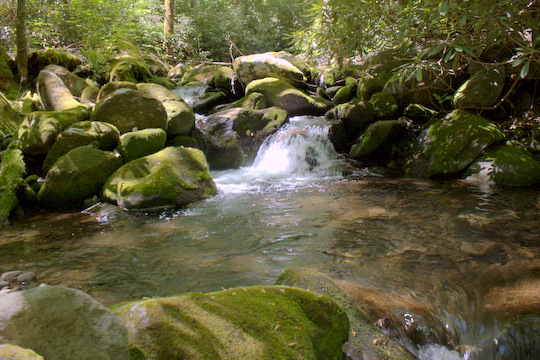 However, up in the Smokies, the key is to head high to the high gradient mid and upper elevation waters that tumble down from the highest portions of the Park. 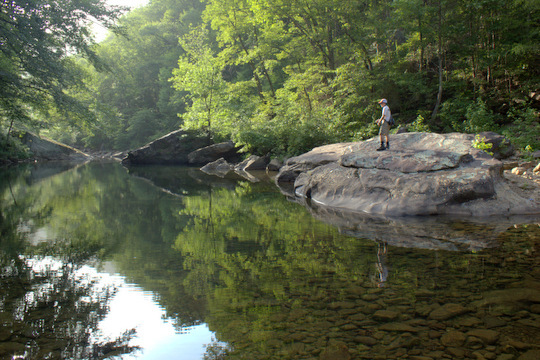 Up high, water temperatures are still perfect for trout so you can fish with a clear conscience. The rhododendron is starting to bloom and will work its way farther and farther up the hill as we move through the next few weeks. I've heard that the Flame Azaleas are peaking right now up on the ridges and balds. With a little luck I may hike up there this week to see the sight for myself before it is too late. 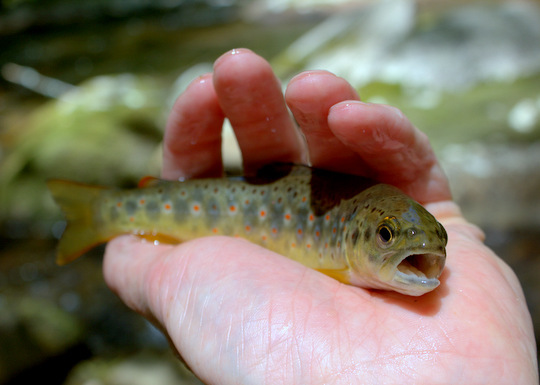 The trout in the streams are happy and willing, but we could definitely do with a little more water. Thankfully, the long range forecast is looking excellent. By late next week, a cooler and hopefully wetter weather pattern will kick in. In fact, if things get really good we'll even be back in the lower and mid elevations of the Park again. I can only hope. 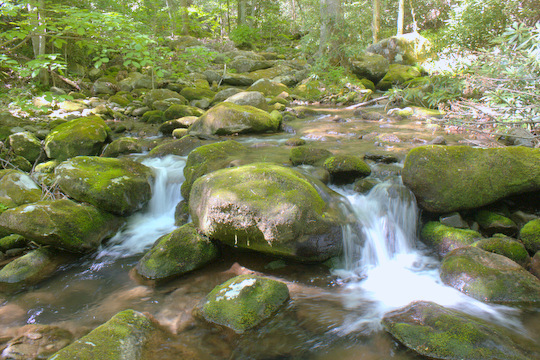 While I have fished a majority of the larger drainages in the Smokies with only a few left to check off the list, there are still many small tributaries to explore. Many of these are far enough off of the beaten path that I prefer visiting them with a friend. The streams of the Park are rugged so there is the safety element, and of course it is hard to beat good company while out on the stream. 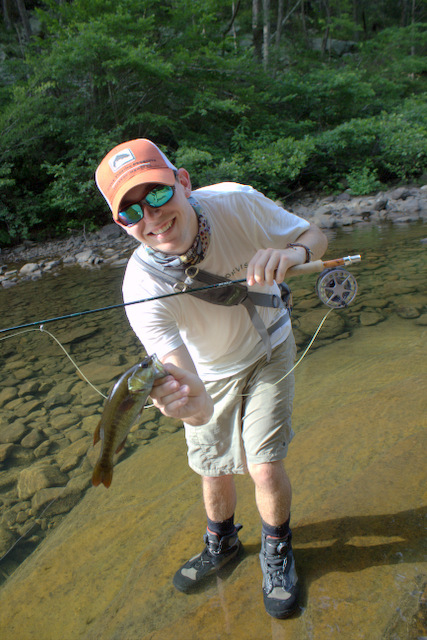 Fly fishing small streams is definitely best with a friend or fly fishing guide. When Mark from Fishing Small Streams contacted me and mentioned that he would be passing through the area and fishing for a couple of days, I saw an opportunity to meet a fellow small stream enthusiast and explore some new water. Fast forward a couple of months to mid May, and I'm headed up to the Smokies to meet Mark at the campground he is staying at. We discuss the plan for the day while glancing at a map and then head towards the trailhead for our first stream. A short and pleasant hike gets us to the lower portion of the stream we wanted to target first so we drop in and start fishing. Almost immediately, Mark caught the first fish of the day. Moving up the narrow creek required climbing over and around large boulders. The exertion was worth it though. 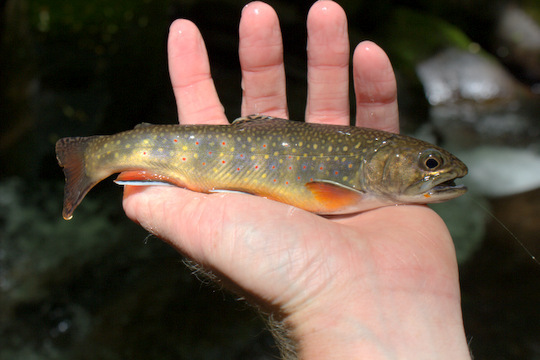 Nearly every little pocket was good for at least one trout, the majority of which were some of the prettiest brook trout you will find anywhere although a few rainbows were in the mix as well. Both of us caught several gorgeous fish. 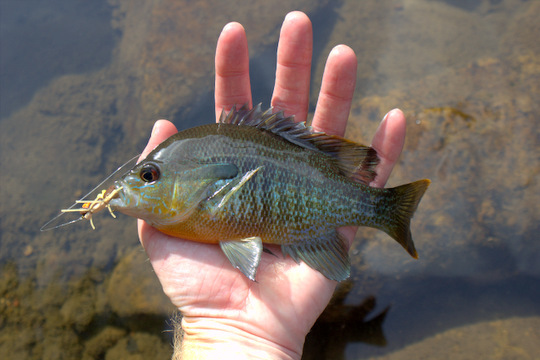 Even though they were all small, they made up for it with an attitude suitable for a fish several times their diminutive size. As we moved along up the stream, I paused to take some scenery shots as well as a picture or two of Mark fishing. On these small streams, shots of a fisherman in action helps put the stream into proper perspective. Later, I discovered that Mark had taken a few shots of me as well. Here is one of my favorites. I was thoroughly amused when I arrived at the campground and discovered that I would not be the only one wearing camo for this trip. Apparently small stream aficionados think alike. After we had fished perhaps a quarter mile of water, we decided to hike back and and continue our marathon fishing day by heading to another stream. This one would be new only to Mark. Our decision was confirmed when we reached my car at the trailhead and discovered that another fisherman had arrived while we were fishing and had undoubtedly started somewhere above us. Fishing used water is never a good thing on these small streams so we definitely left at a good time. The next stream was a lot larger as its name would suggest. 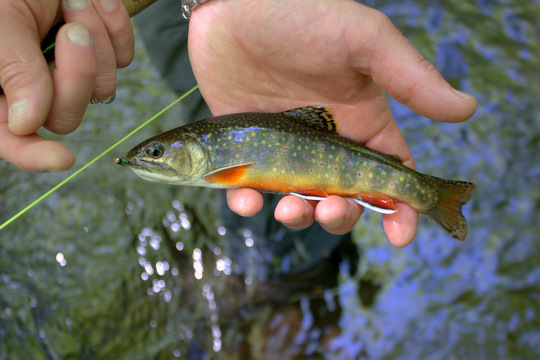 Rainbows and a few brown trout inhabit its waters with brook trout up in the headwaters as is the norm on most Smoky Mountain streams. With limited time, we decided to just fish right near where I parked the car. 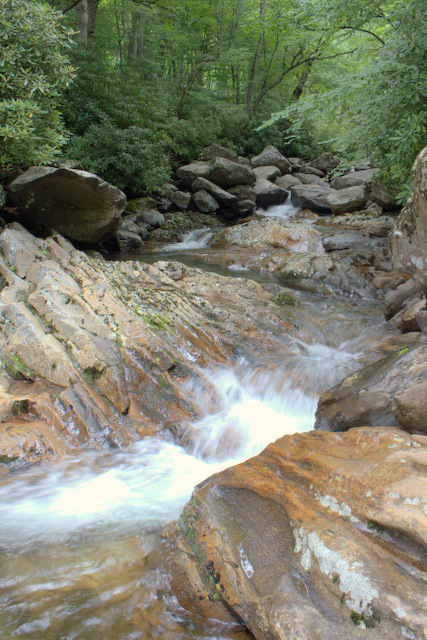 On most streams, I prefer to hike in a ways to get away from the crowds, but this particular stream seems to get less fishing pressure than most. The fish were responding with enthusiasm right away and mostly to dry flies. Does it get any better than this? By this point, we were both getting a little tired but still had another stream or two to check out. Thankfully, both of them were close to the campground he was staying at so we headed back. 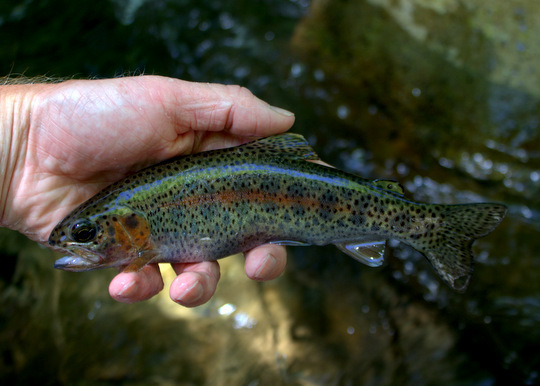 To make a long story short, both streams near the campground were great for both small feisty rainbows and some more beautiful specks. 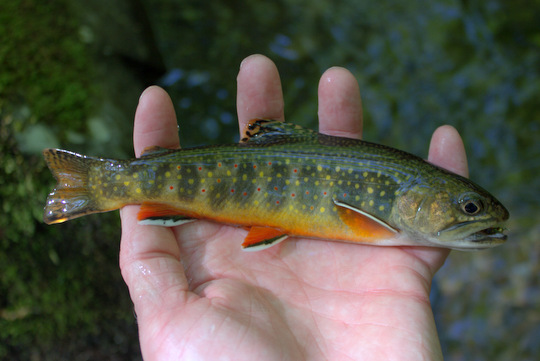 The brook trout in this area are prolific, so much so that at least one area stream is used as a collection stream by the NPS when doing brook trout restoration efforts. With the sun sinking low in the sky and a long drive home, I said goodbye and headed out. It had been a good day on the water with a new friend. Let me know when you are headed down this way again Mark and we'll find some more new streams to check out! 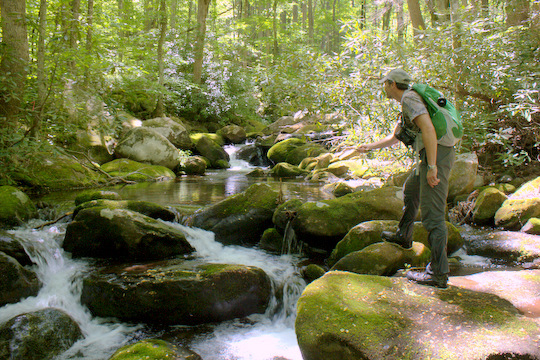 Read Mark's take on our day and the rest of his time in the Smokies HERE. 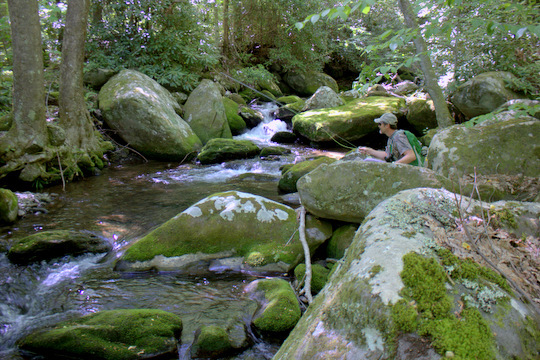 If you are interested in a guided fly fishing trip to fish small streams in the Great Smoky Mountains National Park, please contact me at (931) 261-1884 or at TroutZoneAnglers@gmail.com. Thank you!